Vinit R Rai | OK Listen! Vinit R Rai, a Delhi based Singer/Songwriter & Composer. The voice and lyrics behind “Ravana” , Hrut, Shavyatra etc by Bhramm, his Pune band, one you might have heard rocking and rolling with Delhi’s very own Psy ‘O’circle, and above all, his Solo debut album in the year 2014, "Aaghorii". 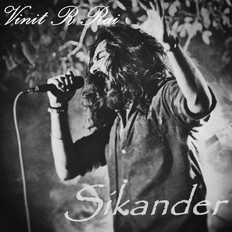 Vinit’s been thundering stages and making the crowds go wild and crazy with tracks like Shankara, Charas, and more, from quite some time now. Though living a Rockstar kinda dream ain’t as easy as it seems, it has been about six years for him in the circuit and not ruling out the social tantrums people around. He still continues creating & pouring his heart out through his songs.